Reservations are now being accepted. To reserve a room, you may call the reservations line 1-800-362-2779, and mention the code TCS. Or, use this special link to book online TCS Hotel Reservations and click on Book a Room. It has the code pre-filled. The fun begins on Wednesday, Sept 11, with check-in and Hospitality Room get-together. Tours on Thursday and Friday are being finalized and will be posted here and sent by email to all members. Our business meeting will be held Saturday morning, with the banquet Saturday evening. We know you'll enjoy our speaker for the evening, Mr. Christopher Chadwick, President and CEO-Retired, Boeing Defense, Space and Security, located in St. Louis. We'll be sending by mail the Registration Forms for the reunion and will also post on Facebook. It is also available by clicking on the link below. Mark your calendars - hope to see you all in St. Louis! Registration Form for 2019 Reunion Registration Form for the 2019 Reunion in St. Louis. Please complete and mail to Tom Sparr. 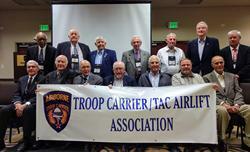 The 39th Troop Carrier Squadron alumni group held its annual reunion in conjunction with the Troop Carrier/Tactical Airlift Association in Dayton, Ohio, October 11-14, 2018. The schedule of events included a visit to the National Museum of the United States Air Force, with a Troop Carrier/Tactial Airlift Memorial Dedication on Friday, with a buffet dinner that evening. Following breakfast on Saturday morning, we had the pleasure of hearing the most inspiring speakers ~ first, a presentation of the Battle of An Loc and the crash of the C-130 and rescue of the crew in April 1972. Listening to those actually involved was incredible, and we felt as if we were right there with them during the rescue. Ray Snedegar then spoke of the C-5 Babylift Crash which occurred in April 1975. The photos he presented and the story he told of the tragedy that unfolded brought tears to our eyes. A bright spot was when he introduced Aryn Lockhart, one of the babies who survived the crash. What an inspiration she is! We thoroughly enjoyed hearing her story. A banquet was held on Saturday, with retired Air Force officer and professor, Alan Gropman as our speaker. We said our goodbyes on Sunday, and hope to meet again soon! Photos of the reunion are posted on our Flickr page. Please CLICK HERE to view these and photos of past reunions. We held our business meeting on Friday evening and discussed several possibilities for 2019 reunion. We will be sending a survey to all 39th members for their input on their preferences.